A viscerally terrifying and often hilarious thrill-ride, even if the seams begin to show in the final act. 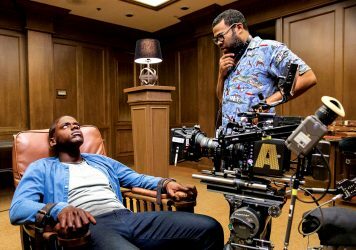 More unwieldy but also more ambitious than Get Out – a film that demands multiple viewings. 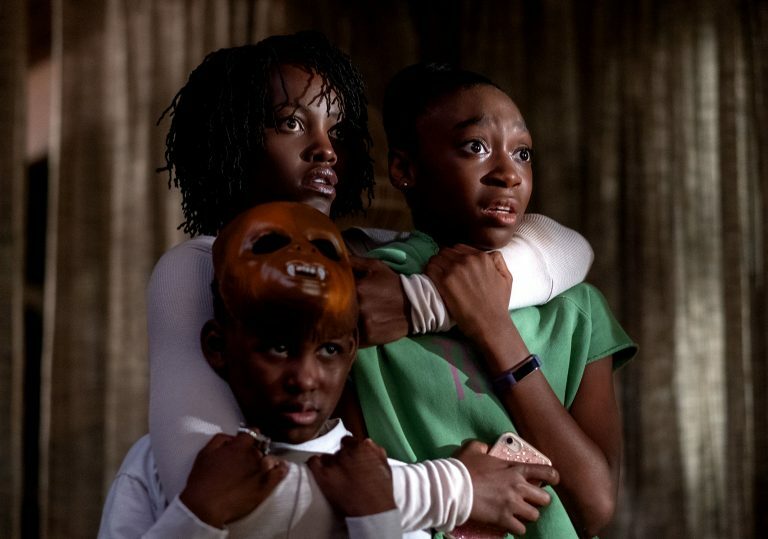 The next instalment of Jordan Peele’s proposed series of ‘social horror’ films is finally upon us with, well, Us. 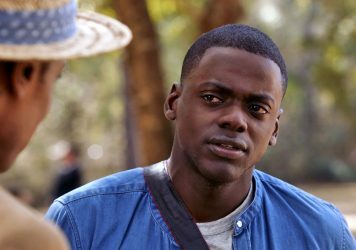 It’s an ambitious and sprawling work mostly in keeping with the tone set by 2017’s Get Out. As with that film, Peele is less interested in pinpointing the corrosive aspects of American culture, than he is in making his audience look inwards. The story opens in Santa Cruz, 1986, as a young girl, Adelaide Wilson, wanders into a hall of mirrors. Instead of an obvious jump scare, Peele keeps the thing that terrifies her into wide-eyed shock off screen, allowing the encounter to hang in our minds for the rest of the film. Cut to 30 years later and a now adult Adelaide (Lupita Nyong’o) is on the road back to Santa Cruz with her husband Gabe (Winston Duke) and their two children, Zora (Shahadi Wright Joseph) and Jason (Evan Alex). After a stretch of build-up and some goofing around (which includes a charming sing-along to Luniz’s ’90s banger I Got 5 On It), a family identical to theirs shows up in their driveway, robed in red boiler suits and wielding gold scissors. With the doppelgängers, who refer to themselves as ‘The Tethered’, Peele takes aim at how society interacts with underclasses and Others; the Tethered appear as creepy, funhouse mirror versions of ourselves. Their backstory and motive (which becomes more confounding the more you think about it) is held back for most of the run time, yet the film still expends as much energy in attempting to define the doppelgängers as it does the family at its centre. Gabe’s double is a slow moving, brutal brawler. Jason’s double is a pyromaniac with the mannerisms of a wild dog. Zora’s double is a silent creep who shares her running ability. Adelaide’s double, named ‘Red’, is the ringleader. She speaks in an unholy, guttural rasp and moves in a manner that alternates between a spider-like scuttle and the refined movements of a trained dancer. In Adelaide and Red, Peele has gifted Nyong’o roles worthy of her vast talents. Her dual performance is the anchor of the movie, filling both characters with pathos and a clear sense of trauma, complicating our view of the victims and their assailants as the film goes on. Slowly, these extraordinary individual performances begin to meet in the middle. The supporting cast around her are excellent too – as Gabe, Duke is on a charm offensive, dropping corny jokes, obsessing over a beaten down boat he can’t really operate, and generally just being adorable. Elizabeth Moss and Tim Heidecker are effectively deployed as the family’s vacuous and superficial token white friends, giving us a clue into the kind of people with whom Adelaide’s family associates. Peele keeps his protagonists charming even when they’re in peril, which only makes us root for them harder. 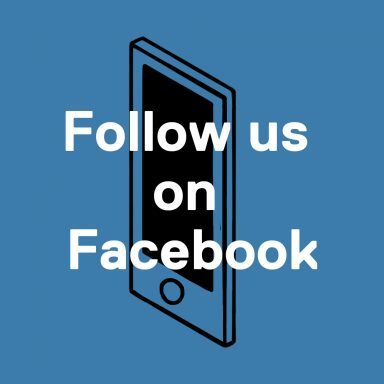 But Us is sly in how it manipulates our sympathies and then forces us to reconsider them, suggesting that the people stalking our lovable protagonists may themselves be the result of a systematic injustice. In one telling moment, Gabe code-switches towards AAVE to try and scare The Tethered from his driveway when they first appear, highlighting his and his family’s educated, upper-middle class background. Us works on the same level as a zombie movie; Night of the Living Dead by way of Hitchcock. It starts as a home invasion movie which centres on a black middle class family to something bigger and more challenging. The monsters are shambling, shrieking feral parodies of humans, only here they’re decked out in matching uniforms. Rather than just representing the worst and most savage human impulses, the Tethered embody the sins of the establishment coming back to haunt them, forcefully reclaiming a space in society that they’ve long been denied. There’s a lot to piece together here, as Peele is a little less didactic with the central metaphor of Us than he was with the similar symbolic layering in Get Out. It invites more clue-finding than that previous film, keeping the overall meaning fairly opaque. Us also swings a little wildly in terms of its structure and tone – it’s often hysterically funny and entertaining in the moment, but the gags can feel a little at odds with what’s unfolding on screen. Sometimes Peele’s film seems like it might buckle under the weight of its ambitions, as it gets increasingly outrageous and feverishly expands on its own internal mythology, mixing the horror with extremely dark comedy as it moves from one wild scenario to the next. But it manages to hold on, and it helps that all of its formal aspects are so engaging. The set-pieces are suspenseful, terrifying and slickly directed. One standout sequence later is expertly scored and choreographed to a slowed-down, nightmare version of ‘I Got 5 On It’, of all things. Peele knows better than to rely on cheap, temporary jump scares, eliciting shock through simple movements of the camera – Mike Gioulakis (who also shot Under the Silver Lake) provides some truly creepy, memorable imagery. These moments aren’t always announced with booming score cues; silence is valued just as much as Michael Abel’s impressive score, comprised of otherworldly chants and booming percussion. Despite some minor stumbles, Us is a supremely confident and ambitious second outing from Peele. He uses the genre to explore aspects of America that its citizens would often rather not. Though it does clash with the tone in one or two instances, Peele’s sense for comedy is often a welcome touch – at some points, it’s even surprisingly cruel. 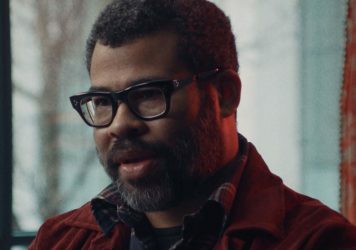 Us cements Peele’s reputation as one of modern horror’s most exciting voices, and it’s hard to resist mentally projecting what the hell he might come up with next. The American writer/director discusses his nightmarish new horror. The Get Out director is reviving the classic show for a post-truth world.